I am so excited for this event this year! We really wanted to go last year but had other plans, so this year it is at the top of our priority list. On Sunday, October 30th ghosts will come to life for the 18th Annual Halloween at the Glenwood as actors in costume discuss life and death in our mining town by their graves. Mark your calendar to attend this unique event from 12pm-2pm. There is no admission charge, but donations for the Glenwood Cemetery’s maintenance are greatly appreciated. The photo above is of "Jim Church". He is one of the people buried at the Glenwood Cemetery. 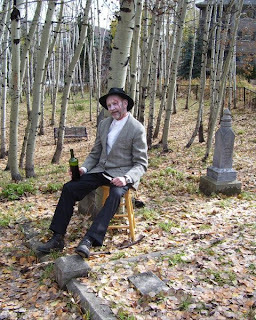 You will get the chance to "visit with him" and hear all about his life in old Park City. If you would like to help with this event, please contact Jenette atjenettepurdy@gmail.com or call 435-649-7457 x5102. Visit the Glenwood Cemetery, one of the oldest cemeteries in Utah.